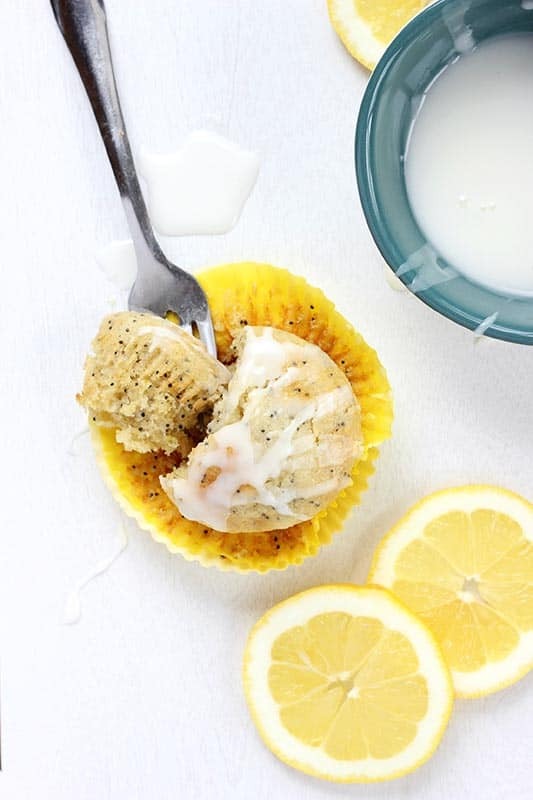 These Lemon Poppy Seed Muffins have the perfect mix of sweetness and tart! 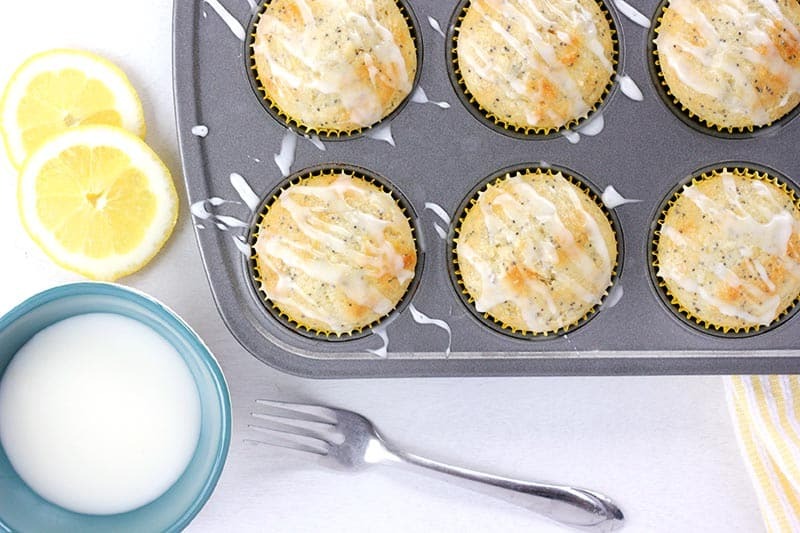 Made with yogurt, fresh lemon juice, and lemon zest for a fresh flavor! 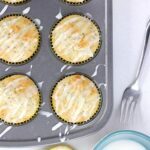 These super simple muffins are ideal for serving for breakfast or brunch! The use of fresh lemon in the cake itself paired with the tart lemon glaze gives these a fun springtime flavor boost that is out of this world. We have served them to guests, brought them to parties, and enjoyed them as a special Sunday treat. They are perfect for all occasions! 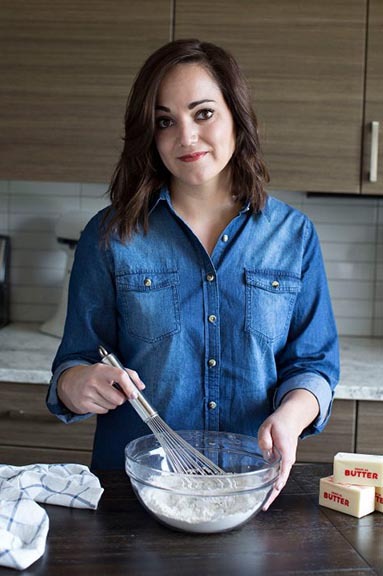 The secret to this recipe, like most of my baked goods, is to use quality ingredients. Be sure to pick out your lemons, scrub them clean, and use a zester that will give you fine pieces. You want to zest just the yellow part of the fruit. Once you start to hit the white interior you’ll know to stop. Also, you want to make sure all of your ingredients are at room temperature. This will ensure even mixing and perfect muffins! Play around with the types of oil you use. I have used both vegetable and coconut with success. The possibilities are endless. No yogurt on hand? Swap it out for sour cream. This really adds to the tangy flavor of the lemon and helps it shine as the star. Preheat your oven to 400 degrees. Line 2 regular sized cupcake tins with paper liners. Set aside. Combine the flour, sugar, poppy seeds, baking powder, baking soda, and salt in a large bowl. Gently whisk. Stir together the eggs, yogurt, apple sauce, lemon zest, 1/3 cup lemon juice, and extract if using. Fold into the dry ingredients. Hand mix until all of the ingredients are incorporated. Divide between 18 muffin cups. Bake 13-15 minutes or until a toothpick inserted into the center comes out clean. Whisk together the confectioners sugar and remaining 1/4 cup of lemon juice. 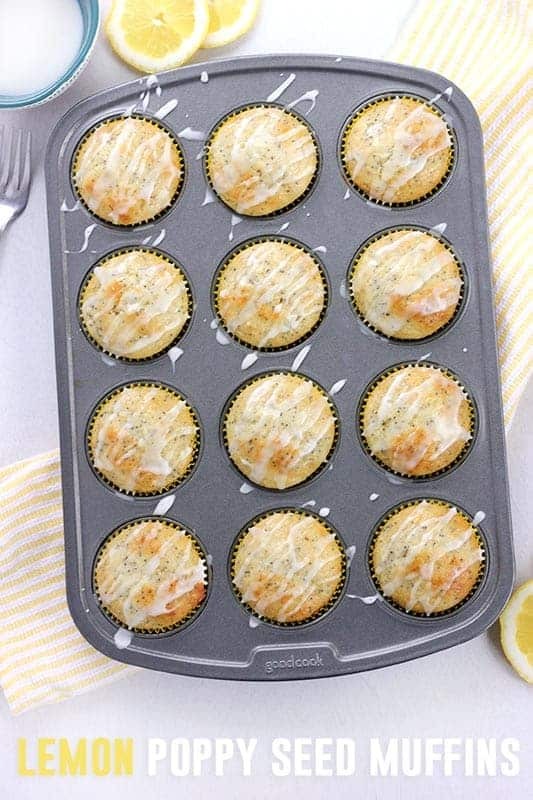 Dip or drizzle your muffins. I like to use coconut oil in place of the vegetable oil in this recipe but have had success with both!